February is the month when rainfall in Jakarta and other areas in Indonesia are highest and floods become a threat for residents. This year’s February also witnessed floods in many parts of Jakarta including sub-districts Bidara Cina, Kampung Melayu, Cawang, Bukit Duri, Angke, Petamburan, Tanjung Priok, Kelapa Gading, Koja, Cilincing, Rawa Badak, Kamal Muara, and Kapuk Muara. These areas were inundated by between 10 and 50 centimeters of water. Floodwaters also caused lengthy traffic jams in many main streets in Jakarta. Fortunately, the extent of this year’s flooding was not as great as in the last two years. In February 2007, the worst flooding in Jakarta's history inundated about 70 percent of the city, killed at least 57 people and sent about 450,000 fleeing their homes. In February 2008, 37 of 267 subdistricts in Jakarta were inundated by more than 40 centimeters of water. Floodwaters caused public transportation, including the busway lines across Jakarta, to stop operations, leaving thousands of passengers stranded. Last year’s flood also inundated the Sedyatmo toll road to Soekarno-Hatta International Airport, which resulted in the cutting off the highway for a few days. Nearly 1,000 flights were delayed or diverted and 259 flights were canceled. Interestingly, this year’s rainfall in Jakarta is higher than that in 2008 and is about the same with the 2007 rainfall. This year’s highest rainfall per day happened on February 2, 2009 reaching 339 millimeters. This year’s highest daily rainfall is slightly higher than that in 2007 (317 millimeters) and much higher than that in 2008 (117 millimeters). It is important to note that the high rainfall in the Jakarta’s neighboring areas was also blamed for the major flood in 2007. In response to the last year's flood, Governor Fauzi Bowo set several strategic measures including ensuring the early warning systems are effective, dredging the river to enable the water flow properly, revitalizing the Pluit, Sunter and Riario dams, and placing mobile water pumps on the Sedyatmo toll roads to anticipate the blackouts. I would argue that the low enormity of this year’s flood is also subject to the effectiveness of such measures. Such measures may be able to mitigate the impact of this year’s flooding, but still cannot prevent the flooding. 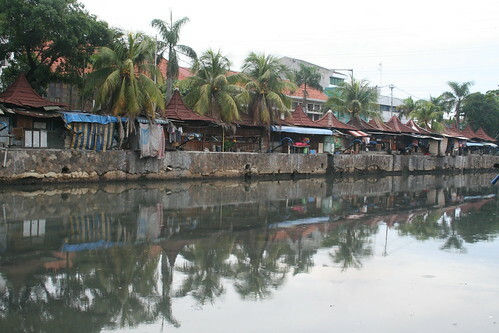 Jakarta has 18 main canals and 500 smaller canals of 2 to 15 meters in width. The Jakarta’s network of canals performed only 50 to 70 percent of its capacity because these canals have been silted up with 9 million cubic meters of sediment and garbage (The Jakarta Post, February 2, 2009). 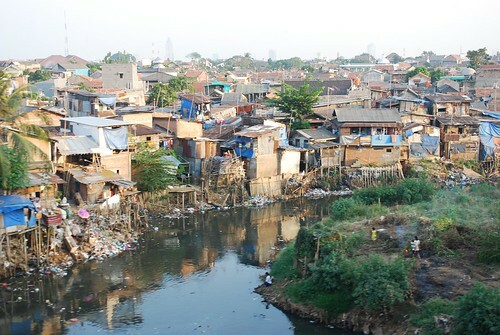 Furthermore, Budi Widiantoro of the Jakarta Public Works Agency blamed the garbage as the main cause of the low capacity of Jakarta’s canals (The Jakarta Post, January 14, 2009). This is certainly a big challenge for the Jakarta administration to educate its residents to not throw away garbage into canals. Dredging canals will not be an effective way of reducing flood if people still throw away garbage into canals. In the aftermath of the 2002 major flood, the central government and Jakarta administration plan to build the East Flood Canal project. The project is aimed at reducing floods in a 270-square-kilometer flood-prone area of East and North Jakarta, but it has progressed very slowly. As of February 2009, the Jakarta administration has procured only 62 percent of the needed land. The East Flood Canal is sought to be most feasible solution for preventing future flooding in Jakarta, but apparently the East Flood Canal is not easy to be materialized. Neither dredging the canals and rivers nor building new canals is a sustainable solution for preventing future flooding in Jakarta. As the economic, commercial, cultural and transportation hub of the nation, Jakarta is poised to grow faster than other parts of Indonesia. The annual floods are strong evidence that Jakarta cannot sustainably accommodate its rapid growth. Indonesia needs to redistribute the central functions from Jakarta to other parts of the nation and create more urban agglomerations to pull urban growth away from Jakarta. Relocating central functions out of Jakarta will reduce the rapid growth in Jakarta and eventually become a sustainable solution for preventing future flooding in Jakarta. There are areas here in Manila that experience flooding during heavy rainfall but fortunately not the entire metro suffers from such massive flooding and destruction. However, those areas that are constantly affected are usually low-lying areas. There is even a district we call the CAMANAVA that is already below the sea-level, thus flood is a year-round occurence. CAMANAVA has a flood control infrastructure project but it has not taken off due to costs. And its efficiency is still under question knowing that the entire area is susceptibe to flooding. I wonder if parts of Jakarta is already below the sea level. That would definitely be a problem especially with the rising sea levels. Are the urban problems in Jakarta already too bad to consider relocation? I just recently learned TransJakarta monthly ridership in the last two years. There are three drops in ridership within one year--the drops during the 2 year ridership occur in the same month. The first drop is around the month of December for New year. The second drop is around September for Idul Fitri. Those are my assumptions. And then the third drop is interesting because it occurs during the month of February. It took sometimes until I realize that it might be related with the seasonal flooding. If it is true, this is another example how severe the effect of flooding, even a relatively new infrastructure cannot cope with it.